After a blustery warm start to the day, the temperature began to fall and the wind abated for a prefect November day for cross country. Neither of the day’s two races failed to deliver as both were knock-down, drag out affairs. In the girl’s race, four girls went right to work and straight to the front to insure the pace was hot from the gun. Oyster River’s Meagan Doody, Coe Brown’s Elisabeth Danis, Exeter’s Jacqueline Gaughan and Bedford’s Leya Salis were definitely on it, followed to the second pack fronted by Kristie Schoffield of Merrimack Valley , Violet Sullivan of Exeter, and Danielle Slavin of Oyster River and a pack of Coe-Brown and Pinkerton runners at the 1000 meter mark. The pace never slackened as the ladies headed out to the Mines Falls section with all four girls in tow and the chase pack falling further behind. But out in the back part of the course, with Doody staying on the gas, the top four started to break up with Bedford’s Salis the first to crack. Coming back across the canal, Doody was in the front dictating the pace, followed by Danis with Gaughan gamely hanging on. The chase pack was gaining on Salis, but with a solid gap and the chase pack out of sight, Salis was left alone in no man’s land. Once across the bridge for the second time, Doody asserted herself as New Hampshire’s number one and powered away to win in 17 minutes, 34 seconds, eighteen seconds faster than her winning time last year. Danis and Gaughan also finished under last year’s winning time, posting a 17:42 and 17:47 respectively. Salis hung on to fourth with Schoffield in 5th. Finishing in the 6th through 10th slots were Danielle Slavin, Violet Sullivan, Chloe Conway of Bishop Guertin, and Alli Pratt and Julia Cormier of Coe-Brown. In comparison with 2014, when the girls’ race featured 14 under 19:00 and 1 in the 17s, 2015 saw an incredible 18 under 19:00 including 3 in the 17’s!!! In what was one of the closest team battles in MOC history, Coe-Brown and Pinkerton battled back and forth using the entire 5k to settle this one. While the Bears pack got out quite well, maybe too well, the Trail Blazers battled back with a strong 2nd mile to infiltrate the Coe-Brown pack of four. Emerging from the woods, with about 1100 meters or so remaining, with a terrific push, it was Pinkerton with five ahead of CBNA’s 3rd. 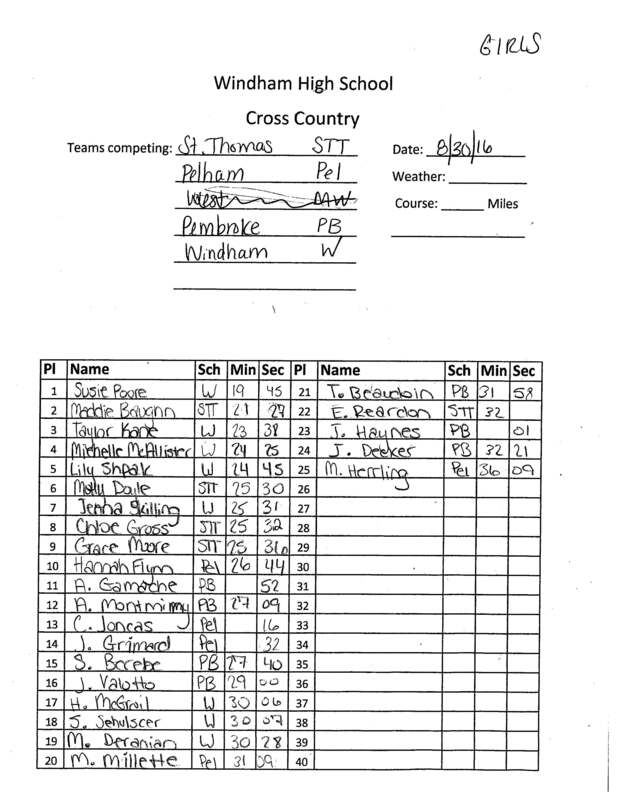 Momentum swung once again when Lady Bear Cormier battled back to pass all five Pinkerton runners over the last half mile only to be challenged once again by Jordan Vaillancourt with 50 meters remaining in a mad sprint finish. In the end, three Black Bears were through in front of the 1st Pinkerton finisher and it would seem on paper that Coe-Brown secured the easy win. However, the next four spots, 11 through 14 went to the Trail Blazers of Pinkerton, with their fifth runner, Morgan Sansing, finishing in 16th. But Coe-Brown had their fifth runner Meg Scannell in right behind Sansing to secure the win, 44 to 51. All in all, Coe-Brown and Pinkerton had ten of the top eighteen runners. With their full team intact, Souhegan launched into the 3rd slot with 130 points. In the New England qualifying fourth through sixth positions were Bishop Guertin, Alvirne and Hanover. Not to be outdone by the girls, the boys put the hammer down early as well. However, different from the girls was that a tight but large pack formed at the front, initially headed by the Division 3 duo of Cam Daly of InterLakes and Dom Repucci of Hopkinton. Lurking in the pack were Timberlane’s Liam Kimball, Oyster River’s Patrick O’Brien, Alvirne’s Kendall Westhoff, Exeter’s Justin Carbone, and a pack of hungry Pinkerton guys. But with so many guys up towards the front, by the time the crew hit the woods, the makeup of the various groups kept changing. What did not change were the guys right on the front of the pack as they headed out back down below the canal. Cam Daly and Liam Kimball were at the front, insuring the pace was hot, turning the race into a long, hard charging final kilometer of pain. As they re-entered the field down by the starting line, Daly had half a stride on Kimball, and they gained separation to Carbone and Nick Sevilla of Pinkerton. With the finish line within his preferred medium, Daly put the hammer down and opened a solid gap back to Kimball, pulling away to win in 15 minutes, 26 seconds, seven seconds better than Eli Moskowitz’s winning time from last year. Kimball followed him in 12 seconds later. Rounding out the top five were Carbone, Sevilla, and Westhoff. Rounding out the top ten were O’Brien, Noah Davis and Jeff Reddy of Pinkerton, Alex Saveliev of Concord, and Cameron Dickson of Londonderry. In comparison with 2014, when the boys’ race featured 9 under 16:00, 2015 saw an incredible 12 under 16:00. With three Astro’s in the top ten you would think Pinkerton would have the win securely in hand. And in this race that would be entirely true. Pinkerton was the clear winner, scoring 48-105, beating Londonderry who came in second. With an insane team average of 15:55, Pinkerton’s top five finished in the top 22, nearly mimicking the Con-Val dominance of 36 points in 2007. That would be quite the cross country team war, 2015 Pinkerton Astros with a team average of 15:55.96 versus 2007 Con-Val with a team average of 15:54.96! In one of the other surprises of the day, Nashua North vaulted to the 3rd position with 162 points. Filling of the New England qualifiers were Oyster River, Coe Brown and Alvirne.